An old favorite gets new life in this innovative game from Pressman. It’s the first game many of us learned, an old standby for when there’s time to kill, easy to learn yet often quite challenging. It’s Tic Tac Toe of course, that quite simple game of both skill and luck that helped us while away many a boring class period. While the old x’s and o’s is instantly familiar and pretty universally played, it can’t be denied that it could use a little innovation to the old formula. For one thing, it’s really short, with multiple short games really the only option available. There’s also the matter of so many ties. If you and your opponent are of equitable skill levels, you’ll just end in a tie the majority of times – and that’s not nearly as much fun. 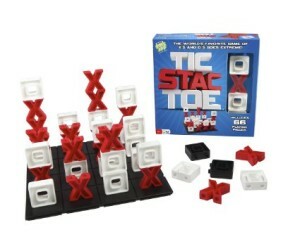 Tic Stac Toe takes all of the great elements of tic tac toe and ramps them up a notch by making it more of a table top affair. While you’ll still be playing x’s and o’s mano a mano, there are a lot of new elements added to make things more interesting. At first glance, it really felt like a cross between tic tac toe and Connect Four. To play, you connect four base tiles to form a square. Each tile is made up of four smaller squares, making a total playing field of sixteen squares. Along with the base tiles, you’ll get your x’s and o’s – but they’re a little different than what you’re used to. You see, in Tic Stac Toe, the action can go horizontally, vertically, and diagonally, just like regular tic tac toe – but it can also go up. The large plastic x’s and o’s actually connect to the base tiles and to each other, helping you to form a row. Rather than going for three in a row, you’ll be trying to make a row of four, and this along with being able to stack the pieces on top of each other means there are many more possibilities to score (and hopefully for your opponent to miss). Other than that, you’ll be playing just like the original, with each player placing one piece per turn. The one who achieves a row of four first is the winner. It’s really quite fun, and much more challenging than original tic tac toe, simply because there are many more places to go with your row. You can build straight across the board, a vertical diagonal line, four on top of each other – whatever you want. There are even suggestions for variations in play, for those who like a little variety. For us, a game typically lasted around 10-15 minutes, making it a great choice for a quick family game time, as you don’t have to block off three hours to do it (I’m looking at you, Monopoly). The box suggests ages eight and up, but even my six year old was really getting into the game. The pieces are quite large, so you don’t have to worry about choking hazards either. The game itself is quite well made, and the red/black/white color scheme is eye catching (making it suitably easy to find the errant game pieces that always seem to wind up under the couch). My one complaint is that it can be a little difficult to disassemble the pieces at the end, as they stick together pretty tightly. You just need to give them a little wiggle and they’ll pop apart, though, so it’s not too much of an annoyance. Tic Stac Toe is a unique new variation on an old favorite. By combining all the best parts of tic tac toe with some challenging new rules and a great 3d game board, it’s an innovative way to take everyone favorite game of x’s and o’s to a whole new level.